The breakout film centers on a fallen soldier who somehow finds he has joined the ranks of the living dead. Bart Gregory (David Anders) has just recently been laid to rest - so why is he still up and walking around? The only way he can keep himself from diminishing to dust is to supply himself with a constant supply of fresh blood. He quickly decides to do law enforcement a favor by cleaning up the streets. The vampire romance is one of today's hottest genres in movies, television and novels, from the Twilight and True Blood to The Vampire Diaries, Underworld and Interview With the Vampire, but it all started with Dark Shadows, the ABC daytime series that brought tormented hero Barnabas Collins into the homes of devoted fans every weekday for five years. Now, in an unprecedented event, the entire series - 1,225 episodes on 131 discs - will be released in a single deluxe set. 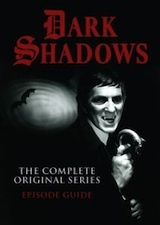 On May 8, 2012, MPI will release Dark Shadows: The Complete Original Series in a custom coffin shaped box with bonus, in-depth interviews and other video extras, a commemorative booklet and more. The SRP for this collector's set is $599.98. Contains All 22 Episodes of The CW's Hit Spy Drama And Over Three Hours of Never-Before-Seen Content, Including Blu-ray Exclusive Content!